After disappointing third quarterly performance, Advance Auto Part’s stock plummeted over 16%. 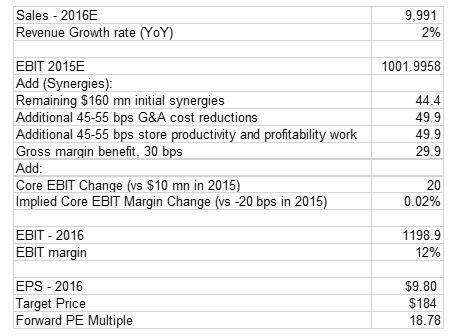 Guided EBIT margin of 12% for FY 16 seems achievable. Despite short-term challenges, outlook of FY 16 seems bright; with improvements in supply chain, completion of integration efforts across additional stores and consolidation of Carquest stores in first quarter of. These underlying factors lead us to reiterate Out Perform rating on stock with target price of $184 per share. 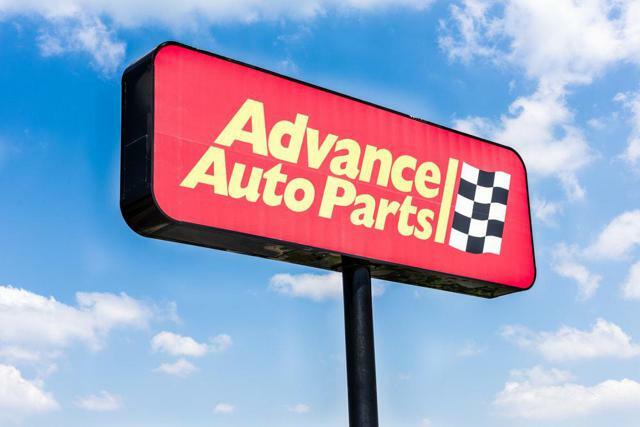 Advance Auto Parts, Inc. (NYSE:AAP ) reported weaker than expected quarterly results for third quarter of FY 15, following which the company’s stock declined over 16%. Despite this, we reiterate Out Perform rating on Advance Auto Parts with target price of $184 per share, representing upside potential of 12% from Monday’s closing price of $164.22. Despite short-term challenges, we maintain our bullish stance on Roanoke based automotive aftermarket parts manufacturer based on expected benefits to be reaped in over the next fiscal year; streaming in from improvements in supply chain, completion of integration efforts across additional stores, consolidation of Carquest stores in first quarter of FY 16 and achievement of guided 12% EBIT margin for FY 16. For the third quarter, sales reported modest 0.3% YoY growth to $2.29 billion, missing our revenue forecast by $30 million. The comparable sales (comps) reported 0.5% YoY growth, down sequentially from previous quarter’s 1% comps growth, well below our forecast of 1.6% growth. Unfavorable FX and integration with General Parts International, Inc mainly impacted sales trends. The company’s management further attributed disappointing sales to lower fill rates, which were partly impacted by supplier issues and partly impacted by human capital. The company expects fill rates to improve from the current quarter. The weakness in comps was observed across all fronts. The Do-It-Yourself (DIY) channel improved modestly through posting flat comps growth, which is a bit disappointing given industry’s potential and success of company’s Speed Perk loyalty program. At the same time, comps from Commercial (do-it-for-me) channel remained weak due to on-going softness observed at Carquest US stores. Along with it, cannibalization from the nine WorldPac stores opened last year, adversely impacting comps growth by 36 bps. We believe that cannibalization should not be a concern as the existing customers are just being transferred to new non-comp stores, which means that the low comps growth is not outlaying the true picture. For the fourth quarter, the company forecast comps to fall likely in the range of flat to slightly negative, much lower than Street’s expectation of 1.7% positive growth. Taking into account one-time factors including New Year’s shift and FX, we forecast comps to be around 1%. Our estimates also suggest deceleration on two-year basis, despite the fact that disruptions in integration will be lower relative to previous quarters. Gross margins for the third quarter contracted by 20 bps YoY, whereas it was expected to improve by 47 bps. The dip in gross margins was attributed to modest supply chain deleverage and higher inventory expenses related to product integration, which was partially offset by lower product acquisition cost. Despite short-term challenges, there are many potential tailwinds for Advance Auto Parts moving forward into FY 16. The company’s management expects to deliver an integrated catalog across its business by the first quarter of FY 16, along with launch of point of system in the fourth quarter of FY 16, accompanied with piloting ‘integrated parts availability’ project. All these initiatives will smooth and improve in-store availability and supply chain issues that have severely impacted topline performance in the previous quarters. We expect significant benefits streaming in from additional store consolidations. During the third quarter, the company managed to complete 83 store integrations across three markets including Memphis, Indianapolis and Portland. For the fourth quarter, the company expects around 110 store projects across four markets to be consolidated, converted and relocated, with initial feedback suggesting that performance is trending as expected. Moreover, the company has decided to bring forward consolidation of 60 to 70 Carquest stores to first quarter of FY 16, which was previously scheduled for later half of FY 16. The decision will enable the company to avoid the comps growth drag by these underperforming stores. We believe that these tailwinds will more than offset the current challenges being faced by the company. Our bullish stance is further supplemented by the performance of stores, where integration efforts have been completed such as Maine and Texas, where comps improved by 900 bps and 400 bps as compared to pre-integration run rates. The Bangor market, which has historically been a really weak market for Advance Auto Parts, is streaming in mid single digit comps growth, following the completion of integration efforts. For FY 16, the company reaffirmed its guidance to achieve EBIT margin of 12%, suggesting an improvement of 180 bps from FY 15 expected EBIT margin of 10.23%. Our estimates outlay that the company requires modest sales growth of 2% as compared to current year’s sales growth of 1%, and $20 million increase in core business EBIT. We believe that these are not heroic assumptions and would be easily achievable, given expected improvements in supply chain and additional store consolidations. For FY 16, we estimate earnings per share of $9.8, which represent forward price earnings (NYSE:PE ) multiple of 18.8 x, representing 13.8% discount from last three year’s median PE multiple of 21.7x. We believe that the stock is undervalued at current levels and provides an attractive investment opportunity, as most of the investors have restricted their focus towards weak short-term performance, ignoring impact of significant improvements expected in FY 16. 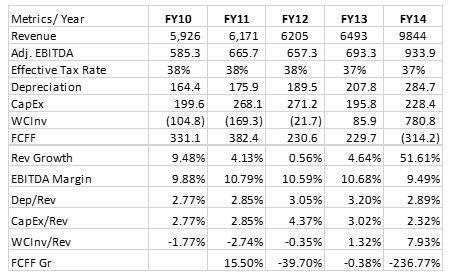 The table below illustrates our estimate for FY 16. All the figures below are given in $ million except for percentages. The following is an excerpt for the financial performance of Advance Auto Parts. All the figures below are given in $ million except for percentages. In order to derive financial valuation, we have taken into account the above-mentioned factors and extrapolated recent past averages to forecast future trends. The table below summarizes the key assumptions for projections till 2020. With regard to capital structure, the company has 12.37% debt based on Market Value. When considered the discounted cash flow (DCF) valuation method, assuming terminal free cash flow to firm (FCFF) growth of 0.5%, the enterprise value turned out to be $15.1 billion. Taking into account long-term debt of $1.64 billion, the equity value is $13.46 billion. Assuming 73.1 million outstanding shares, the intrinsic value of stock is estimated to be $184.